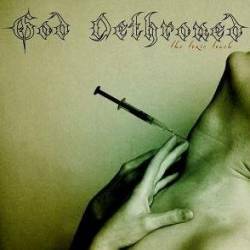 God Dethroned, one of Europe's most popular death metal bands, continue to become more melodic album by album. The Toxic Touch is already their seventh release and has not much in common with earlier works like The Grand Grimoir and Bloody Blasphemy. Nevertheless, it's the logical follow-up to their killer album The Lair Of The White Worm, even if The Toxic Touch unfortunately doesn't contain a club hit like Sigma Enigma. But the album has enough other strong tracks with enough potential to become classics in the God Dethroned history. 2014 is one of the band's most melodic tracks, taking advantage from various changes of pace. Falling Down is a groovy and rhythmic track that easily enters your ears. On Wings Of Pestilence is one of the most powerful and technical songs ever written by God Dethroned. It's followed by The Day You Die, surely too slow to be called a midtempo song, but the right groove makes it rock. Away From Emptiness is an instrumental that wouldn't cause too much disturbance on a Scorpions CD and shows the musicians' improved abilities. And Typhoid Mary is a gothic song as you knew it from the early Paradise Lost. Real crude parts are a rarity on this record, only Hating Life and Fail To Exist show a slight departure from the early God Dethroned history. God Dethroned have again been able to produce a first class death metal album, far away from the huge average mass known to this scene. Brutality and speed are still present, but the harmonic integration of melodic, technical and gothic elements works so well that these foreign influences don't disturb the music. At a first thought, I couldn't name you any better contemporary death metal act.